Revenue in the Suits (men & boys) segment amounts to US$22,661m in 2019. The market is expected to grow annually by 2.7% (CAGR 2019-2023). In global comparison, most revenue is generated in China (US$4,058m in 2019). In relation to total population figures, per person revenues of US$3.08 are generated in 2019. The Suits market comprises, in a narrower sense, men’s suits consisting of a jacket and a pair of suit trousers (two piece suits), which can optionally be combined with a vest (three piece suits). The segment of formal men’s apparel has come under pressure during the past years due to a cultural change in the professional world, as casual clothes are meanwhile widely accepted in many industries and areas of public life. Consequentially, purchase frequencies and sales volumes tend to be on the decline. However, producers are faced with further prospects for growth as customers are willing to pay higher prices. Reading Support Revenue in the Suits (men & boys) segment amounts to US$22,661m in 2019. Reading Support The Suits (men & boys) segment is expected to show a revenue growth of 2.4% in 2020. Reading Support The average revenue per person in the market for Suits (men & boys) amounts to US$3.08 in 2019. Reading Support In the market for Suits (men & boys), volume is expected to amount to 180.57 m pcs. by 2023. 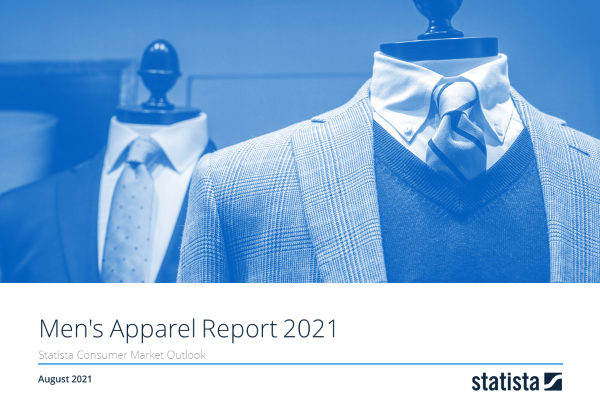 Reading Support The market for Suits (men & boys) is expected to show a volume growth of -0.5% in 2020. Reading Support The average volume per person in the market for Suits (men & boys) amounts to 0.02 pieces in 2019. Reading Support The average price per unit in the market for Suits (men & boys) amounts to US$129.96 in 2019. Reading Support With a market volume of US$4,058m in 2019, most revenue is generated in China. Here you can find more studies and statistics about "Suits (men & boys)".